PokerStars is a huge poker company that runs several poker rooms online under the PokerStars brand. PokerStars.eu is an international poker room with players from many different countries, while PokerStars.fr, PokerStars.it and PokerStars.es are national poker rooms limited to French players, Italian players or Spanish players, respectively. 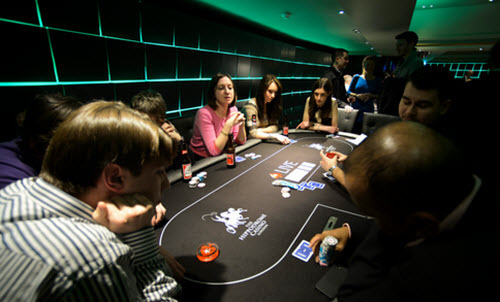 The national poker rooms has been created by PokerStars to comply with national gambling legislation in those countries. This review will focus on PokerStars.eu. When you sign-up with PokerStars you receive a $20 no deposit bonus. When you make your first, second and third deposit to PokerStars, you get a 100% bonus on each deposit. You can get a total of $600 in deposit bonus from this welcome package. PokerStars do offer fast poker, the type of poker where you are moved to a new table as soon as you fold you hand. PokerStars version of fast poker is called Zoom Poker. As can be expected, the largest online poker room in the world has a great tournament selection, from free rolls to high rollers. This is true for both scheduled tournaments and sit ‘n go tournaments. Two high points of the tournament year at PokerStars are the World Championship of Online Poker (WCOOP) and the Spring Championship of Online Poker (SCOOP). PokerStars always have tournaments available where you can win a travel package to a major offline poker event, such as WSOP, WSOPE, Aussie Millions, European Poker Tour, Latin America Poker Tour, Asia Pacific Poker Tour, or the UK & Ireland Poker Tour. PokerStars is not a part of any poker network, so they have their own proprietary poker software that they are in full control of. A downloadable poker client is available for Windows and for Mac OS X. Web browser play is also available. PokerStars offers mobile poker play on smartphones and tablets. PokerStars.eu is by far the most well-trafficked poker room online, both in terms of cash game traffic and in terms of tournament poker attendance. Statistics published by PokerScout for mid-November 2015 show that PokerStars.eu had an average of 14,500 ring game players online for a 7 day period. PokerStars only offers email support. This means that there is no way to get real-time support (phone support or live chat support). The email address is support@pokerstars.com. A notable exception from this policy is the phone support offered by PokerStars Deposit Assistance Department. If you encounter a problem while depositing money into your account, a pop-up window will open and you can enter your phone number to let the Deposit Assistance Department know that you want them to call you. The Deposit Assistance Department can also be reached by email, the address is dad@pokerstars.com. Examples of transaction methods that can be used here are Neteller, Skrill, VISA, MasterCard, PaySafeCard, ClickandBuy, Ukash, WebMoney and Entropay. Transfering money between a PokerStars account and a Full Tilt poker account is easy, since PokerStars and Full Tilt Poker are owned by the same company. PokerStars was launched in 2001. In 2012, PokerStars parent company acquired Full Tilt Poker.